Message 1906953 - Posted: 14 Dec 2017, 6:01:54 UTC - in response to Message 1906840. Different Work Units will be processed at different rates. My I7 takes from 50min to 2hrs 20min to process a WU, depending on what type it is. My GTX 1070s, take from 2min 30s to 8min depending on the type of WU. Your Dad's computers are under the name Ted? One of them has a huge Ghost issue (ghosts are where the Seti server allocates you work, and thinks you have it, but for some reason, you don't). It shows 12,221 tasks in progress. The maximum possible for that system is 400. And looking at the CPU run times for some of the completed WUs, the system with the Ghosts does have a serious problem. It's run times are excessively long; even the system that is crunching OK, the CPU times are longer than they should be (CPU time and Run time for a WU should be pretty close (within 5min or less). What AV programmes are you running on those systems? Do you have internet browser tool bars or helpers installed? Are you running other CPU intensive programmes on those systems? The 16GB of RAM, is that 4*4GB modules? Task Manager a lone will let you see which programmes are using up CPU time. Ideally it should just be the applications for the CPU, and GPU. That's pretty much it. Once you get the systems sorted out so CPU time isn't being sucked up by other programmes, then you can use the Lunatics installer to install the AVX application, and some command line values to really make SoG work on your video cards. But you need to sort the systems out first before going further. At this stage it looks like I've been doing everything wrong. Let's start over with a clean slate. I know the machine sees the graphics cards, the processors and the memory. What I don't know is how to get Boinc to run at it's full potential with these specs. I've been looking at the SIV64x app and the graphics cards are only running at 4%-6% while the CPUs are running at 100%. It's almost like Boinc just doesn't see the graphics cards. So that's what I'm asking. If start everything over from scratch with a fresh Windows 10, how does Boinc get the most out of the hardware? Message 1907076 - Posted: 14 Dec 2017, 22:33:09 UTC - in response to Message 1907075. If you want full potential from the cards, go back to trying a Linux install. You did have them running at one point didn't you? Message 1907100 - Posted: 14 Dec 2017, 23:41:35 UTC - in response to Message 1907075. Can you post a screen shot so we can see what you are seeing. Or the first 30 lines of the Event Log after a fresh startup of BOINC. That will tell us if BOINC is seeing the cards and whether they are seen for both CUDA and OpenCL by the drivers. Message 1907147 - Posted: 15 Dec 2017, 2:09:01 UTC - in response to Message 1907075. It looks like your TR is running the cpu and gpu tasks with the stock apps and the times for completed tasks are normal for the stock apps. You can improve that by using the Lunatics Optimized apps for both cpu and gpu. The better cpu app is the AVX r3330 app and the best Nvidia app is either the r3557 or r3584 SoG app. Both available in the Lunatics 0.45 Beta-06 installer available at Crunchers Anonymous, Lunatics or Mike's World web sites. It would help if you provided the host ID of your Dad's TR machine so we could look at some of its completed tasks. Also the first 30 lines of the Event Log after a fresh start of BOINC. Message 1907150 - Posted: 15 Dec 2017, 2:14:29 UTC - in response to Message 1907075. BOINC will only configure the applications for the most common denominator with default settings. That will not get the most performance out of the hardware. That will take some personal tuning of applications and parameter tuning for each application. Windows 10 will not help or hurt the BOINC applications. AV programs can and do. You should always exclude any AV program from monitoring or scanning both the main BOINC folder and the BOINC /Program Data folder. People, there is a serious hardware or software issue with one of the systems, hence poor processing times. Even the one that is working OK, isn't working as well as it should. The 1900X is processing OK. The use of command line values would result in a huge boost in GPU performance. And the CPU processing times are OK, however there is a larger than I would expect discrepancy between the Run time & CPU time. Something is using up CPU time that could be used to crunch. Less than 2min difference, not almost an hour. Using the Lunatics Beta6 installer and installing the AVX application for the CPU (and SoG for the GPU with appropriate command line values) would result in even more work being done- but sorting out what is using up the CPU time would make a big difference as well. The 1950X has got some serious issues. It is producing an incredible number of Ghosts, and it's run times are excessively long for both CPU and GPU. It shows the same Integer & flops values as the other system but it's performance is woeful. The 16GB of RAM, is that 4*4GB modules or just 2*8GB? And a new one- what is the temperature of the CPU? It's clock speed? Until both machines start using the SoG app, with appropriate tunings for the cards, we really can't state whether there is anything wrong with the gpu's. OTOH, the cpu tasks are showing a very overloaded condition with the cpu_time grossly longer than the actual run_time. This could simply be explained if they are trying to run cpu task on every core, physical and virtual. We all know that for every gpu task that you need to dedicate one full cpu core. If they are trying to run 32 cpu tasks concurrently, then the times make sense. Also, with TR you have to know what memory mode, UMA or NUMA, you are in and the consequences of trying to access memory locations that are in the other CCX than the one the cpu task is currently running. We need to know how many concurrent cpu tasks they are running and how many gpu tasks they are running. I have found with Ryzen that cpu tasks run best only on the physical cores. I also found that you need to keep overall cpu utilization in the 60-70% range to keep cpu_time and run_time close. I would reduce the number of concurrent tasks to <project_max_concurrent>12</project_max_concurrent> or <project_max_concurrent>10</project_max_concurrent> depending on how many gpu tasks are running alongside the cpu tasks. It is also best to use affinity to assign cpu tasks only to physical cores and let the virtual cores support the gpu tasks. Message 1907186 - Posted: 15 Dec 2017, 4:50:30 UTC - in response to Message 1907181. Both systems are using SoG with the default values, so they're comparable in that regard. So reserving a CPU core for each GPU WU would make sense. If you used the default settings to install BOINC then putting a app_config.xml file in the project directory with the following values will reserve 1 CPU core for each GPU WU being processed. If the GPUs run out of work, then those cores will then pick up CPU work. In the BOINC Manager, select Options, Read config files for the settings to take effect. Message 1908500 - Posted: 22 Dec 2017, 22:34:28 UTC - in response to Message 1907147. It would help if you provided the host ID of your Dad's TR machine so we could look at some of its completed tasks. Is that not this page? Definitely upped the GPU usage a bit. Went from .4% to 15%-20% usage, but still nowhere near my other machine which is pulling a 75%-80%. And that machine does not have this text file. I also saw someone mention something about r3557 and r3584 SoG apps? I can't seem to find them online. What do those do? Seeing as you're running stock apps you're already running the r3584 version which shows up as "setiathome_v8 8.22". The r3557 app is what most of us who run under "anonymous platform" use and shows up as "setiathome_v8 8.20", this comes with the Lunatics 0.45 Beta6 installer. Message 1908516 - Posted: 23 Dec 2017, 0:08:52 UTC - in response to Message 1908500. Check my previous very long post, there are serious issues with the 1950X system. It is producing lots of Ghost WUs, its CPU processing time is ridiculously long as well as it's poor GPU performance. You need to check it's clock speed & it's temperature- there is some serious issue that is hindering it's performance. If you were to apply the settings I gave you to the 1900X system, or better yet use the Lunatics Beta6 installer to install the AVX application and apply the settings I gave for the SoG application you would get probably double the amount of work out of that system, if not more. But the 1950X is seriously broken. Message 1908537 - Posted: 23 Dec 2017, 1:46:11 UTC - in response to Message 1908516. OMG, that TR system needs to be taken offline. The amount of 'ghosts' on that machine must be crippling the database. I would recommend using the latest Lunatics 0.45 Beta-6 installer on both systems. But first, you need to take a serious look at the clocks on the TR system. I tried installing the Lunatic and now Boinc doesn't want to open. After re-installing it, it's back to it's old slow self. I hope everyone knows that I am truly thankful for all the time you've spent in replying to my questions on how to run this software. It's been great! I just think that I'm in way over my head on this one. To reiterate, the only purpose these machines serve is running Boinc. That's it. We've got no other apps running with the exception of the ones you recommended like the SIV64X. My Dad truly believes that one machine (16-core) is not pulling it's weight. It's easy to see since the 8-core machine finishes a task in 5 to 8 hours while the 16-core machine is up to 12-15 hours. Problem is neither of us understands a majority of what's being posted on this thread. Ghosts? Crippling the database? How are we crippling the data base? If I can't get the answers here or help on this thread, where else should I go? 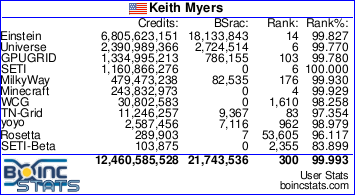 We've got machines built for Boinc! Why is it so hard to run the darn thing? Message 1908674 - Posted: 23 Dec 2017, 22:13:37 UTC - in response to Message 1908673. Ghost refer to work unit that the server "thinks" you have even though they may not appear on your computer's hard drive. Example. Say you start to download 64 work units and something, anything happens that prevents you from finishing downloading or your antivirus for whatever reason decides they are trojans and quarinteens them then delete them. I've had it happen when the I've had 2 computers sharing the same network and one sends a request and the other is downloading, interrupting the download. So the server "thinks" you still have those work units even though you don't have then anywhere anymore on your computer. So now it thinks you have X+64 work units when you really only have X. Trouble is, you can actually grow that "ghost" number up into the hundreds to thousands depending on how many computers you have. I remember having 400+ ghost at one time. There is a trick to getting rid of them but it's time consuming. Usually we just wait for them to time out (reach their deadlines) Unfortunately, that means they end up as errors and count against you at some point in the future. Now we need to get back to what is wrong with your TR machine. Message 1908677 - Posted: 23 Dec 2017, 22:22:57 UTC - in response to Message 1908673. A couple of questions, when you say only Boinc is being run on the machine, what Boinc projects is it running? Only S@H or others such as E@H also? As I understand it this is tripple card machine. I think I would learn to walk before trying to run so to speak. I would run only one project with only one card for a while, at least a week, in order to get a base line. The simpler things are the easier they are to debug. The on Seti output from the CPU is going to be pretty trivial compared to the IIRC gtx1080ti you are using. An easy and useful monitor is GPU-Z. If the results are reasonable then try 2 cards and see what happens. I would expect almost twice as much thruput with 2. Are you making sure that for each GPU task running that you are reserving 1 CPU core? Running 1 task per GPU means that you need 3 free CPU cores to support those 3 GPU's and running 2 tasks per GPU requires 6 free CPU cores, etc. Message 1908682 - Posted: 23 Dec 2017, 22:43:17 UTC - in response to Message 1908679. That's not the problem, there is a hardware issue with the non performing system.